For other uses, see Balikpapan (disambiguation). 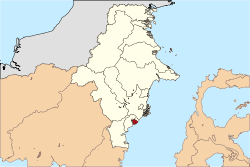 Balikpapan is a seaport city on the east coast of the island of Borneo, in the Indonesian province of East Kalimantan. Two harbors, Semayang and Kariangau (a ferry harbour), and Sultan Aji Muhammad Sulaiman Airport are the main transportation ports to the city. The city has a population of 701,066, making it the second-largest city in East Kalimantan, after Samarinda. Before the oil boom of the early 1900s, Balikpapan was an isolated Bugis fishing village. 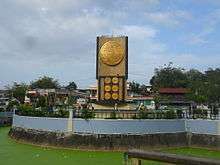 Balikpapan's toponym (balik = "behind" and papan = "plank") is from a folk story in which a local king threw his newborn daughter into the sea to protect her from his enemies. The baby was tied beneath some planks that were discovered by a fisherman. At any other stories, Balikpapan's ("balik" = "behind" and "papan" = "plank") is from an event that Kutai sultanete send planks for aid to Paser Kingdom to build new palace. But the planks back to somewhere location that next time said as Balikpapan. In 1897 a small refinery company began the first oil drilling. Building of roads, wharves, warehouses, offices, barracks, and bungalows started when the Dutch oil company Bataafsche Petroleum Maatschappij (BPM) arrived in the area. On 24 January 1942 a Japanese invasion convoy arrived at Balikpapan and was attacked by four United States Navy destroyers that sank three Japanese transports. The Japanese army landed and after a sharp but short fight defeated the Dutch garrison. The defenders had partially destroyed the oil refinery and other facilities. After this the Japanese massacred many of the Europeans they had captured. Several campaigns, including the longest bombing run so far, followed until the 1945 Battle of Balikpapan, which concluded the Borneo campaign by which Allied Forces took control of Borneo island. Extensive wartime damage curtailed almost all oil production in the area until Royal Dutch Shell completed major repairs in 1950. In 1958 the CIA attacked Balikpapan and stopped oil exports. The US was running a CIA covert mission to undermine President Sukarno's government by supporting right-wing rebels in Indonesia. The CIA, Taiwan and the Philippines had provided the Permesta rebels in North Sulawesi with an insurgent air force, the Angkatan Udara Revolusioner (AUREV). On 19 April 1958 a CIA pilot, William H Beale, Jr, flying a B-26 Invader bomber aircraft that was painted black and showing no markings, dropped four 500 lb (230 kg) bombs on Balikpapan. The first damaged the runway at Sultan Aji Muhammad Sulaiman Airport, the second set the British oil tanker SS San Flaviano on fire and sank her and the third bounced off the British tanker MV Daronia without exploding. Beale's fourth bomb set on fire and sank the Indonesian Navy Bathurst class corvette KRI Hang Tuah, killing 18 crew and wounding 28. Before attacking Hang Tuah, Beale also machine-gunned the oil pipes to Shell's wharf. The CIA had orders to attack unarmed foreign merchant ships in order to drive foreign trade away from Indonesia and weaken its economy, with the intention of undermining Sukarno's government. The day before attacking Balikpapan, Beale had also damaged a Shell complex at Ambon, Maluku. His Balikpapan raid succeeded in persuading Shell to suspend tanker services from Balikpapan and withdraw shore-based wives and families to Singapore. However, on 18 May Indonesian naval and air forces off Ambon Island shot down an AUREV B-26 and captured its CIA pilot, Allen Pope. The US immediately withdrew support for Permesta, whose rebellion rapidly diminished thereafter. Shell continued operating in the area until Indonesian state-owned Pertamina took it over in 1965. Lacking technology, skilled manpower, and capital to explore the petroleum region, Pertamina sublet petroleum concession contracts to multinational companies in the 1970s. With the only oil refinery site in the region, Balikpapan emerged as a revitalized centre of petroleum production. Pertamina opened its East Borneo headquarters in the city, followed by branch offices established by other international oil companies. Hundreds of labourers from Indonesia, along with skilled expatriates who served as managers and engineers, flocked into the city. 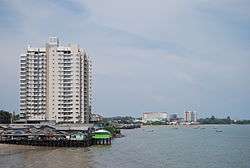 Balikpapan is bordered by Kutai Kartanegara Regency to the North, by the Makassar Strait to the South and East, and by North Penajam Paser Regency to the West. During the Suharto dictatorship Balikpapan achieved unprecedented economic growth by attracting foreign investments, particularly in the exploitation of natural and mineral resources. The policy was heavily criticized for uncontrolled environmental damage and corrupt bureaucrats and politicians, but it significantly boosted urban development in resource-rich cities. In the 1970s Balikpapan experienced 7% population growth annually, while exports of timber and petroleum increased dramatically. Based on Indonesian Most Liveable City Index which measured 27 indicators in every 2 years, Balikpapan is the best city for living in 2013 and toppled Yogyakarta as the best in 2011 and 2009. Balikpapan mainly maintained city management aspects and environment well. As part of the Earth Hour City Challenge, the city of Balikpapan, Indonesia was recognized as the Most Loveable City for 2015.as 2016, Balikpapan nominated for the second times as most lovable and sustainable city and still count down for the final judgement. Some multinational corporations operate in East Borneo. Companies including Baker Hughes (US), ChevronTexaco (US), Halliburton (US), Pertamina (Indonesia), Schlumberger (France), Thiess (Australia), Total S.A. (France) and Weatherford International (US) use Balikpapan as their base of operations in the region. Governmental public services including Bank Indonesia, the Finance Department, Angkasa Pura 1, the Port of Semayang, and several others also attract many people to work in this area. Balikpapan has been chosen as the site of some important governmental agencies such as Komando Daerah Militer VI Tanjungpura and Kepolisian Daerah Kaltim. Balikpapan oil refinery is on the shore of Balikpapan Bay and covers an area of 2.5 square kilometres (1 sq mi). Founded in 1922, it is the oldest refinery in the area. The Allies destroyed it in the Second World War and Shell re-built it in 1950. The refinery has two subunits, Balikpapan I and Balikpapan II. Balikpapan I has two raw oil refinery units that produce naphtha, kerosene, gasoline, diesel fuel, and residue and one high-vacuum unit that produces 100 tonnes (110 tons) of paraffin oil distillate (POD), used as raw material for wax factories. The wax itself has various grades and is sold domestically and internationally. Opened on 1 November 1983, Balikpapan II has a hydro-skimming and hydro-cracking refinery and produces petrol, LPG, naphtha, kerosene, and diesel fuel. Indonesian government and their PT.PERTAMINA (pesero) planning as for 2017 expanding the oil refinery including the area of Persiba Balikpapan FC (old) stadium and Pertamina residents near the refinery. Balikpapan's Major Rizal Effendi ask for primarily using Balikpapan peoples as worker that PT.PERTAMINA needed up to 20.000 new employers. The municipality of Balikpapan's topography is generally hilly (85%), with only small areas of flat land (15%), mostly along the coast and surrounding the hilly areas. The hills are less than 100 metres (330 ft) higher than the adjacent valleys. The altitude of Balikpapan ranges from 0 to 80 metres (260 ft) above sea level. Most of the soil in Balikpapan contains yellow-reddish podsolic soil and alluvial and quartz sand, making it extremely prone to erosion. Balikpapan features a tropical rainforest climate as there is no real dry season in Balikpapan. The city on average sees on average average 2,400 millimetres (94 in) of rain per year. Balikpapan generally shows little variation in weather throughout the course of the year. The city does not have significantly wetter and drier periods of the year and average temperatures are nearly identical throughout the course of the year, averaging about 26 to 27 degrees Celsius throughout the year. In 2012, Sultan Aji Muhammad Sulaiman Airport served approximately 6.62 million passengers according to Angkasa Pura Report. It is currently undergoing a major upgrade to improve its capacity (to 10 million passengers per year) as well as hospitality (immigration, passenger convenience, company reps offices, restaurants, shopping, lodging, and many others). The airport is going to be equipped with 11 aerobridges, a transit hotel, and four-level parking garages. The entire construction is expected to be completed by February 2014. According to Minister of Badan Usaha Milik Negara - Dahlan Iskan, currently Sultan Aji Muhammad Sulaiman Airport can be considered as the top two Airport in the country in terms of beauty, functionality, and advancement. Ngurah Rai International Airport is the only other airport in Indonesia that shares similar modern and complete facitilies like Sultan Aji Muhammad Sulaiman airport. Airlines that use this airport to serve domestic routes are Kartika Airlines, Lion Air, Sriwijaya Air, Susi Air, and Trigana Air. International flights can be accessed through the following airlines: Air Asia, Garuda Indonesia, and Silk Air. The airport is one of the nine principal locations near Indonesia used by Muslims on their Hajj pilgrimage to Mecca. In 1996–97 the airport served over 4,500 East Borneo pilgrims and in 1997–98 it served pilgrims from East Borneo, South Kalimantan, Central Sulawesi, and North Sulawesi. In addition to its airport Balikpapan also has Semayang seaport. It serves commercial boats to many destinations to Indonesia including Jakarta, Makassar, Manado, Pare Pare and Surabaya. In the 1990s maritime transport was very popular. Today, due to more affordable and efficient airplane travel, more people choose to fly. Taking the ferry is a main choice for traveling to Penajam. Kariangau Seaport was built to serve containers and all other industrial needs. It is located in km.13, as part of Kariangau Industrial Estate. As a coastal city it has many beaches including Manggar Beach, Segara Beach, Monument Beach, Kemala Beach, and Brigade Mobile Beach near the police academy and Melawai Beach is the most popular beach for the citizens. Balikpapan is a departure point for nature tourism. There are wildlife exhibitions nearby such as the Samboja Lestari orangutan conservancy, sun bear sanctuary and crocodile breeding park at Lamaru. There is also well-known forest site which has been developed for visitors at Bukit Bangkirai rainforest around 45 mins by car away from Balikpapan. A mangrove forest at Kariangau site is also nice spot for tourism at Balikpapan city. There is still some sites of Japanese Artillery of World War II. Also you can find a Military Monument at Kampung baru. Balikpapan Botanical Garden, which is located at kilometer 15 on Jalan Soekarno Hatta, was officially opened on 20 August 2014. It has 1,200 types of lowland hardwood trees, covers 309.22 hectares and is known as the "green open space" of the city. At the opening ceremony, Forestry Minister Zulkifli Hasan expressed the hope that the Botanical Garden would rival Gardens by the Bay in Singapore. As one of the fastest developing cities in the nation, Balikpapan has been supported by the rise of shopping centers. 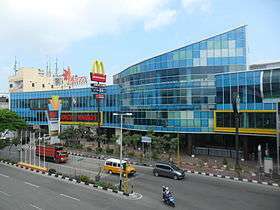 There are six major shopping malls in town which are Plaza Balikpapan, Balikpapan Superblock, Pentacity Mall Balikpapan, Balcony City, Mall Fantasy in Balikpapan Baru, and Plaza Kebun Sayur. ↑ "Pendatang Kota Balikpapan Capai 26.000 Jiwa". Tribun Kaltim. ↑ "Dinas Kependudukan Dan Catatan Sipil". Pemerintah Kota Balikpapan. 1 2 3 Wood, William B (April 1986). "Intermediate Cities on a Resource Frontier". Geographical Review. American Geographical Society. 76 (2): 149–159. doi:10.2307/214621. JSTOR 214621. ↑ Muir, Dan (1999–2000). "The Balikpapan Raid". Forgotten Campaign: The Dutch East Indies Campaign 1941–1942. 1 2 L, Klemen (1999–2000). "The capture of Balikpapan, January 1942". Forgotten Campaign: The Dutch East Indies Campaign 1941–1942. ↑ L, Klemen (1999–2000). "The Balikpapan Massacre, February 1942". Forgotten Campaign: The Dutch East Indies Campaign 1941–1942. ↑ Conboy & Morrison 1999, p. 88. ↑ Lettens, Jan (6 January 2011). "SS San Flaviano [+1958]". The Wreck Site. Retrieved 2011-11-20. 1 2 David Ormsby-Gore, Minister of State for Foreign Affairs (11 June 1958). http://hansard.millbanksystems.com/commons/1958/jun/11/indonesia-british-vessels#S5CV0589P0_19580611_HOC_160 |chapter-url= missing title (help). Parliamentary Debates (Hansard). United Kingdom: Commons. col. 202–203. Retrieved 2011-11-21. ↑ "INDONESIA: The Mystery Pilots". Time. 12 May 1958. Retrieved 2011-11-21. 1 2 3 4 Conboy & Morrison 1999, p. 116. ↑ Conboy & Morrison 1999, p. 115. ↑ Conboy & Morrison 1999, pp. 138, 139, 141. ↑ Kahin & Kahin 1997, p. 179. ↑ Biro Pusat Statistik, Jakarta, 2011. ↑ Titis Jati Permata (12 August 2014). "Malang, Masuk Deretan Kota Paling Nyaman dan Layak Huni". ↑ Sultan Aji Muhammad Sulaiman Sepinggan International Airport. "Sultan Aji Muhammad Sulaiman Sepinggan International Airport - Balikpapan". ↑ "Kepolisian Daerah Kalimantan Timur". Kepolisian Daerah Kalimantan Timur. ↑ "Climate: Balikpapan". Climat-Data.org. Retrieved 19 May 2016. ↑ PT Angkasa Pura I (Persero). "Topping-Off Bandara Internasional Sepinggan - Angkasa Pura - Airports". ↑ "Balikpapan Pos - PROKAL.co". balikpapan.prokal.co. ↑ ". ::Kamar Dagang dan Industri Propinsi Kalimantan Timur::. » Blog Archive » 350 MW Listrik Dari Kawasan Industri Kariangau (KIK)". ↑ "Kebun Raya Balikpapan Bertemakan Tumbuhan Kayu". 20 August 2014. ↑ "Menhut Mimpi KRB seperti Garden By di Singapura". 20 August 2014. Conboy, Kenneth; Morrison, James (1999). Feet to the Fire CIA Covert Operations in Indonesia, 1957–1958. Annapolis: Naval Institute Press. ISBN 1-55750-193-9. Kahin, Audrey R; Kahin, George McT (1997) . Subversion as Foreign Policy The Secret Eisenhower and Dulles Debacle in Indonesia. Seattle and London: University of Washington Press. ISBN 0-295-97618-7. Wikimedia Commons has media related to Balikpapan. Klemen, L (1999–2000). "Forgotten Campaign: The Dutch East Indies Campaign 1941–1942".